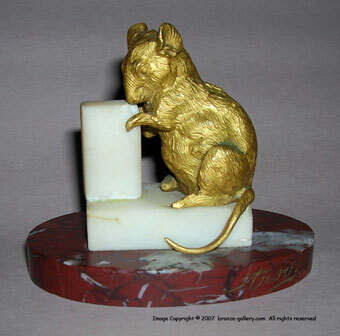 An amusing cabinet bronze of a Mouse eating Sugar Cubes by Arson who was known for his humorous bronzes. The subject of a Mouse nibbling a sugar cube or block of cheese must have been popular in the mid 19th century as it was also done by Valton, Masson, Cain, and others. This Mouse is gilt bronze and signed on his rump and on red marble base. The contrasting gilt bronze is complimented by the rouge marble. A fine and rare miniature.